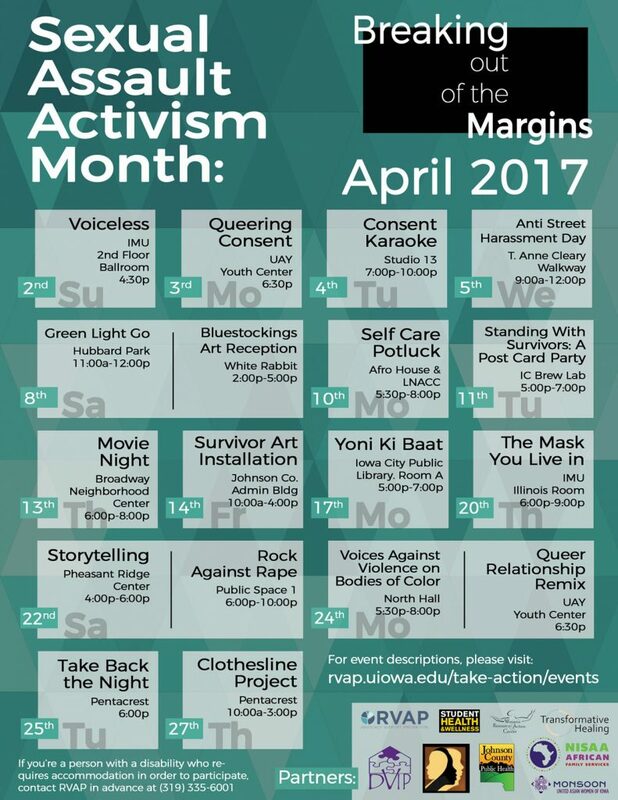 April is Sexual Assault Activism Month–which means it’s time to get moving! Here’s a complete list of the activities calendar which includes descriptions for each event. Spread the word! January is Stalking Awareness Month. Stalking is often sensationalized in movies and other media–join RVAP as they watch clips from current films and discuss the realities of stalking. The Sexual Health Alliance is hosting a free screening of Someone You Love: The HPV Epidemic on Sunday, September 20th at 11am. 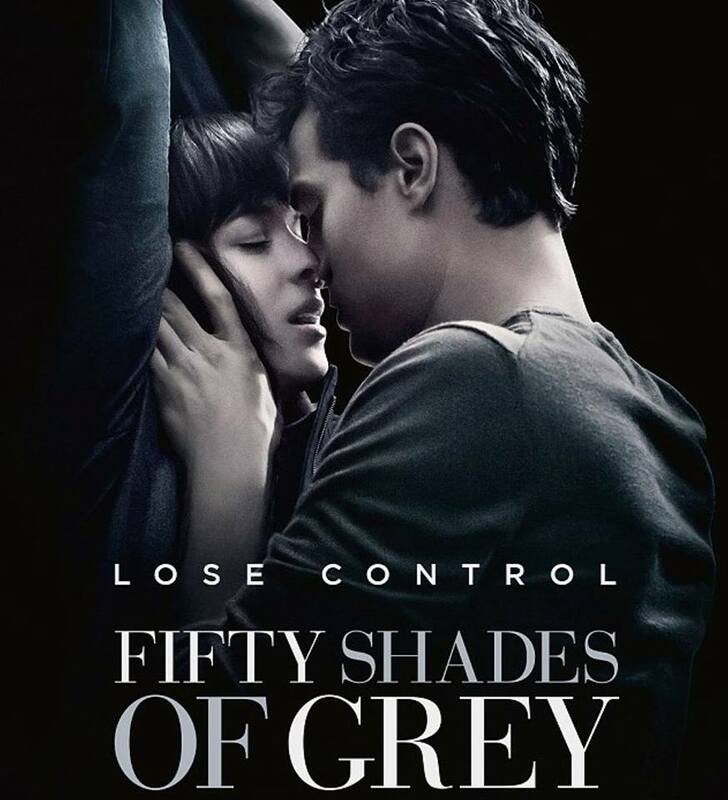 The screening will take place at Filmscene and is sponsored by the Iowa Cancer Consortium and the Emma Goldman Clinic. Immediately following the film there will be a panel discussion with local health experts where audience members can ask questions and learn about available local resources. We hope to see you there! 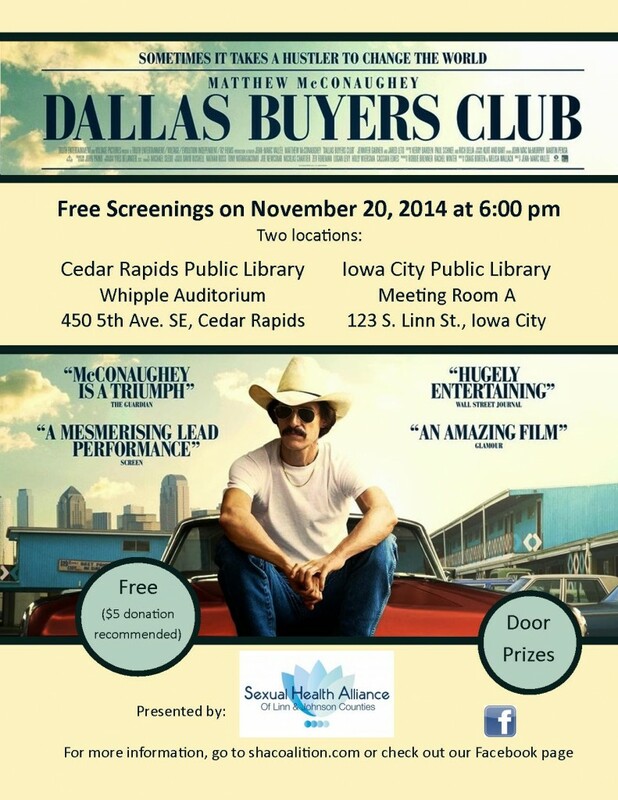 The Sexual Health Alliance is hosting two free screenings of Dallas Buyers Club on Thursday, 11/20 at 6 pm at the Cedar Rapids Public Library and the Iowa City Public Library. There will be door prizes. The screenings are being held in honor of World AIDS Day (which is December 1st). Please join us for an evening of community conversations about sexual health! The event is happening on Thursday, October 16, 2014 at the Clinton Street Social Club (18 1/2 S Clinton St, Iowa City, IA 52240) from 7 – 10 pm. There will be live entertainment, drinks, appetizers, and a silent auction. This event is hosted by the Sexual Health Alliance of Linn & Johnson Counties. 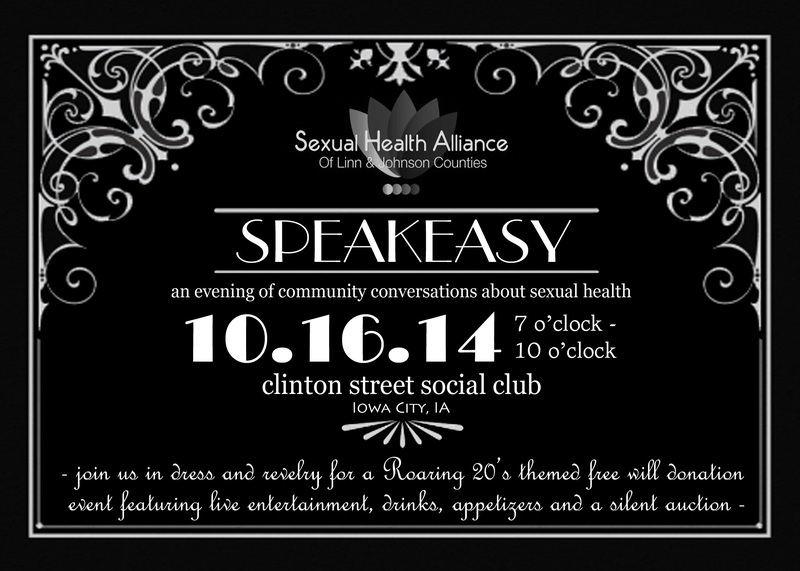 Thursday, Oct 16: SHA Community Engagement Speakeasy 7-10pm, Clinton Street Social Club, Iowa City. Saturday, Dec. 6: The Mirage, 9pm-12am, IMU 2nd Floor Ballroom Iowa City, Iowa. 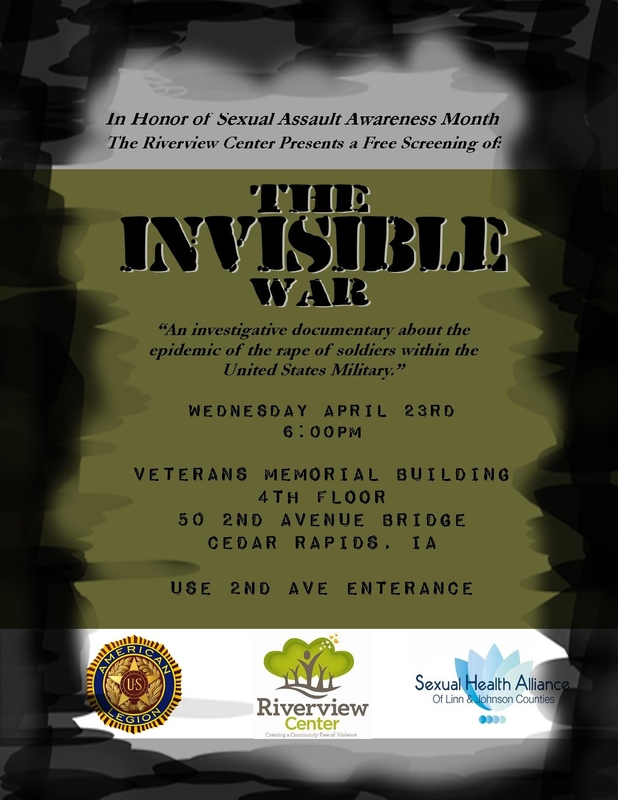 The Sexual Health Alliance of Linn & Johnson Counties is co-hosting a free screening of the documentary The Invisible War for Sexual Assault Awareness Month. The screening is happening Wednesday, April 23, 2014 at 6:00 pm at the Veterans Memorial Building, 4th floor, 50 2nd Ave. Bridge, Cedar Rapids. Use the 2nd Ave. entrance. 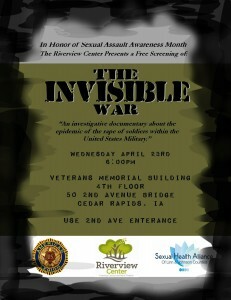 SHA is co-sponsoring this screening with the American Legion and the Riverview Center. 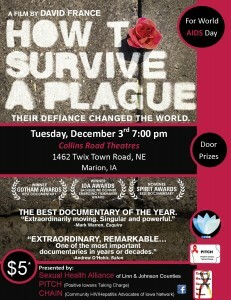 Please join us for a free community showing of the documentary How To Survive a Plague. The documentary will be shown at 7:00 pm on Tuesday, December 3rd at Collins Road Theatres (1462 Twix Town Road NE, Marion) for World AIDS Day. In the 80s and 90s, two coalitions, ACT UP and TAG (Treatment Action Group), helped turn HIV/AIDS from a death sentence into a manageable condition. The critically-acclaimed documentary How To Survive a Plague tells the powerful story of these two coalitions. Health professionals, college students, educators, parents and anyone interested in learning more about the history of HIV/AIDS activism is welcome to attend. The Sexual Health Alliance of Linn & Johnson Counties (SHA) is co-hosting this screening in partnership with the Community HIV/Hepatitis Advocacy of Iowa Network (CHAIN) and Positive Iowans Taking Charge (PITCH). 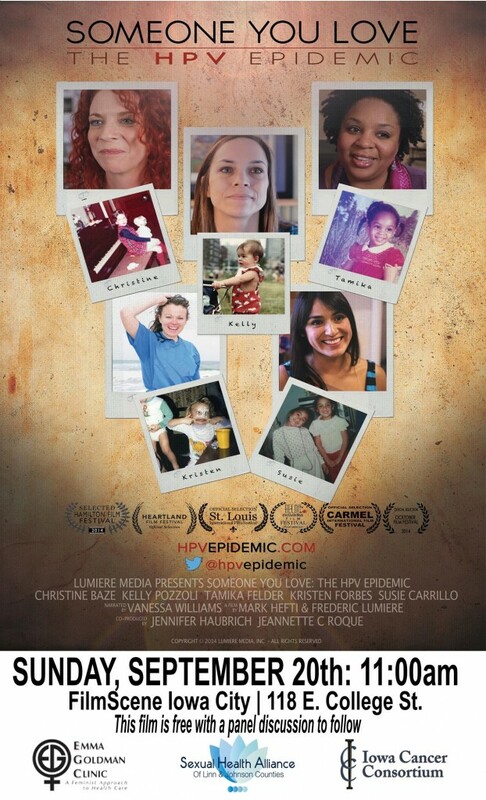 For more information about this film or to see the trailer, please go to surviveaplague.com. The film is unrated. 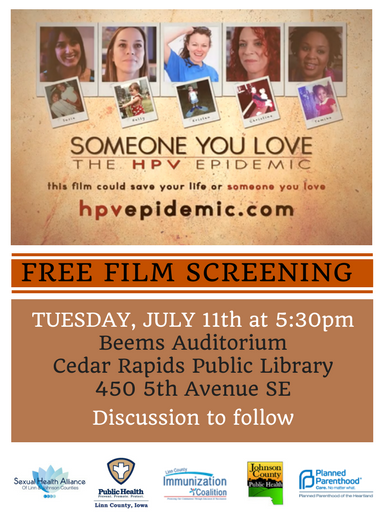 Anyone who attends the screening will be offered a coupon for a free rapid HIV test at Linn County Public Health (501 13th St. NW, Cedar Rapids) or at Johnson County Public Health (855 S. Dubuque St., Iowa City). 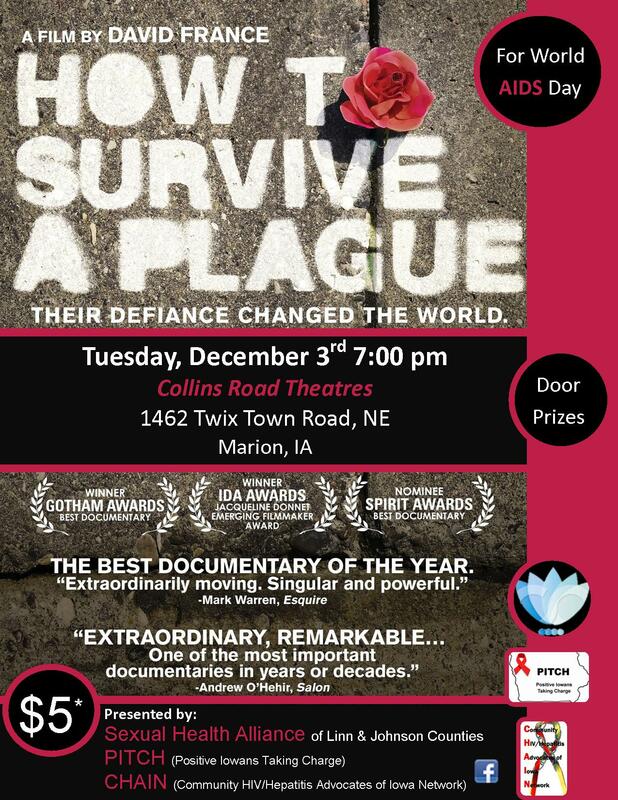 In addition to the How To Survive a Plague screening, other events for World AIDS Day are taking place in Linn and Johnson Counties. Johnson County Public Health will be providing HIV testing to anyone at the Iowa City Public Library on Sunday, December 1 from 1-6 pm and at the Coralville Public Library on Wednesday, December 4 from 10 am – 3 pm. Free HIV testing for everyone will be available at Linn County Public Health on Wednesday, December 4 from 8:30 am – 4 pm.